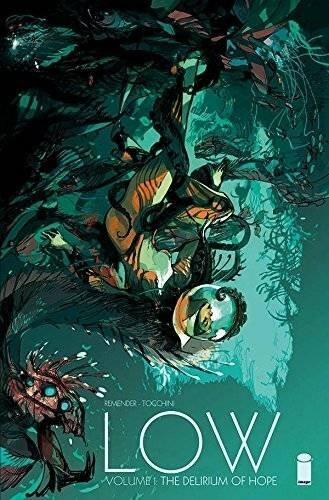 Rick Remender’s Black Science is one of the more interesting science fiction comics available. In it, Remender and co. present a science team working on creating a device that allows them to navigate the multiverse. It goes, quite predictably, awry. The cast is sent spiraling uncontrollably through universe after universe and is pitted against a variety of dangers. The story follows scientist and anarchist-now-working-for-the-MAN Grant. After spending upwards of a decade working on devices known as “pillars,” he finally manages to get them working. His first test is to do an actual jump between worlds. The crew is about to launch their first human test–unapproved. But the pillar has been sabotaged. The characters in Black Science are very likeable. They’re all given fairly extensive backgrounds and their relationships to one another are complex to say the least. The dynamic between the explorers– self-absorbed leader, his followers, and his jaded and neglected children– make for one of the most interesting aspects of the storytelling. Some of the plot points I’m not a huge fan of. Some of the characters, in particular a Native-American-esq shaman with magic healing powers, wore a little thin. The nice part of the story setup, though, is that it is self-correcting. Each event has the potential to be undone or redone in the next universe. Versions of the same characters can interact and effect the plot. It can be overly confusing, but also means that when something I don’t like happens, it may not stay that way. The art is amazing. It’s dark but also vibrant. The characters are ridiculously expressive. The team that works on the art has really tapped into the visuals that can enhance the story and the dynamism that makes science fiction great. While some of the story is going to need to be ironed out as it progresses, I think that the story is engaging and worth the read. This entry was posted in Graphic Novels and tagged Black Science, Grant, Graphic Novels, Image Comics, Multiverse, Pia, Pillars, Rick Remender, Science Fiction. The Death-Defying Dr. Mirage by Jan van Meter and Robert de la Torre is a fantastic story. Dr. Mirage is a parapsychologist. She helps people connect with the spirits of their lost loved ones and can cross over, when necessary, to the world of the dead. She’s been hiding out since her husband’s death. He’s the one spirit she cannot speak to. I want to say everything, but let’s be more specific. There’s some really fun artwork with great attention to detail. In the trade, they talk about the lettering process, the way that the lettering is presented. The very deliberate choices that are used are apparent and really help to set the tone. The coloring in dynamic and entertaining. 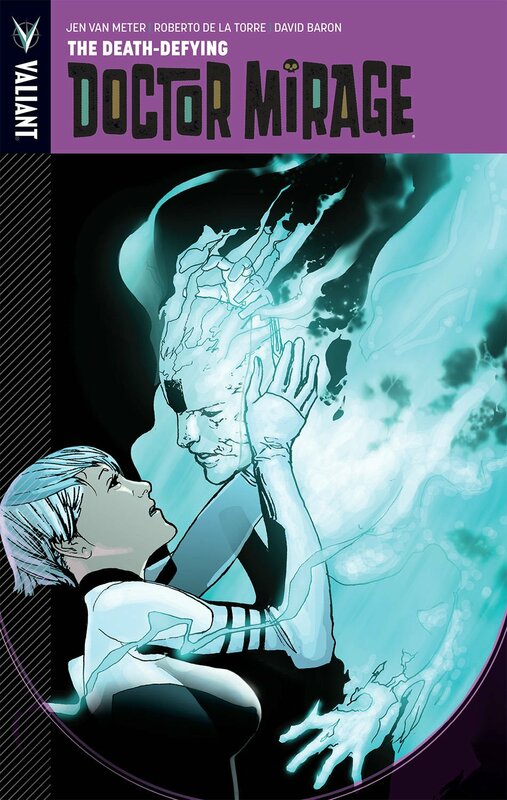 AND Dr. Mirage is awesome. She’s complicated, constantly growing, and a fascinating character. The plot was pretty heart breaking, but man it was worth it. Oh, Rat Queens, how I love thee. Rat Queens, vol. 1 is fantastically funny, blending some of the best parts of fantasy, D&D and girl power. It’s drawn beautifully and has a fantastic sense of humor. Volume 2 is no less fantastic. It shines a light on the backstories of our heroines (I’m using the term liberally) and manages to still retain humor and a new extension of the plot. INCLUDING GIANT SQUID! Just. Do. It. You’ll thank me. This one admittedly wasn’t my favorite. It’s a far future story. Humanity has moved under the sea and there is huge conflict. It revolves around one family that has the power to move the underwater ships humanity is living in. I’m not really sure why it didn’t click with me. It’s got some fun dialogue and great, colorful, and scenic illustrations. I’m guessing it was just a mood problem. I’m going to revisit it and will update later. This entry was posted in Graphic Novels and tagged comics, Dr. Mirage, Image Comics, Low, Rat Queens, Rick Remender, Valiant Comics. Rat Queens is pretty epic. 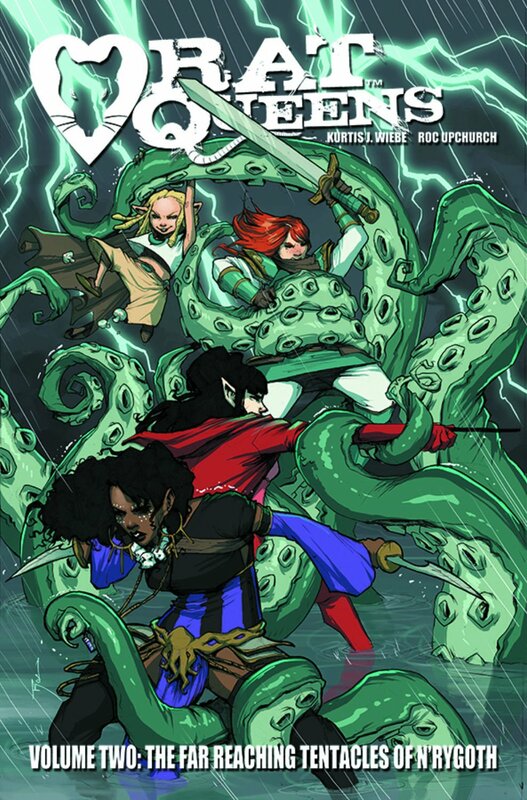 It follows the (mis)adventures of the Rat Queens, a questing group composed of D&D esq classes of rogues. This all girl gang gets in trouble repeatedly. A combination of risk taking, self destructive habits, and collusion means they’re destined for trouble. And now, it’s found them and won’t rest until the Rat Queens are gone. This was described to me as Kevin Smith meets D&D meets girl power. I think it’s even better. The art is compelling and the story rocks. There’s a fantastic sense of humor throughout the entire thing. Despite its light-hearted approach, Rat Queens also tackles some more serious interpersonal issues and builds some fairly complex characters pretty quickly. I’m glad I picked this up this month, because vol. 2 is out in trade on the 19th. I don’t think I could have waited much longer. And now for something totally different (though still pretty good). This entry was posted in Graphic Novels and tagged comics, Ed Brubaker, Image Comics, Rat Queens, Spotlight on Graphic Novels, The Fade Out. This entry was posted in Graphic Novels and tagged Christian Ward, Graphic Novels, Image Comics, Matt Fraction, ODY-C, Odyssey. You may or may not know this. Despite having been brought up around comics and CCGs, I don’t actually have a lot of comics knowledge. I can tell you the different publishers and most of the big names. I can describe what I find appealing about storylines and panel layout, but I’m not very well versed in the classics or in many author’s works in an extensive basis. So, I’m trying to identify some works and persons on whom I can focus. Most of this is his more self-contained works. To be honest, the Bendis-verse is a scary place to enter into. I thought it prudent to limit myself to his more consumable stuff so I don’t get overwhelmed. Let me know what you think. Anything I’m missing? This entry was posted in Graphic Novels, Other and tagged Alias, Brian Michael Bendis, Fire, Goldfish, Image Comics, Jessica Jones, Jinx, Magneto, Marvel, Torso, X-Men. East of West is a feature I’ve struggled to pick up. It’s initial pages didn’t grab me and I put it down for a while. When I was finishing it this week, it grew on me, but I keep thinking about how long it took for me to get into the story. East of West is an apocalypse story pitting Death against War, Conquest, and Famine. Death has been injured; the exact nature of the injury is unknown. He’s seeking revenge against the other three and trying to restore his life to what it once was. Death’s family, and the world, hangs in the balance. The story features some interesting art. It relies heavily on shading and creates some serious depth in the characters. This can be very appealing, but also very abrasive. It blends a more traditional comic book style with some more Manga proportions and stylistic elements. Fun moment! There are some characters that are ink-black and look a bit like Drow. The story itself takes a long time to come together. I think this really contributed to my reluctance to continue with it. I’ll be honest, if I were trying this out as single issues, I probably wouldn’t have continued on with it. Once the story comes together a bit, we see there is a great deal of complicated internal politics within the world and interesting plays on revenge stories. What’s interesting is the ways in which it is a bit similar to Pretty Deadly in subject matter. The stories themselves are different, but share a number of elements. 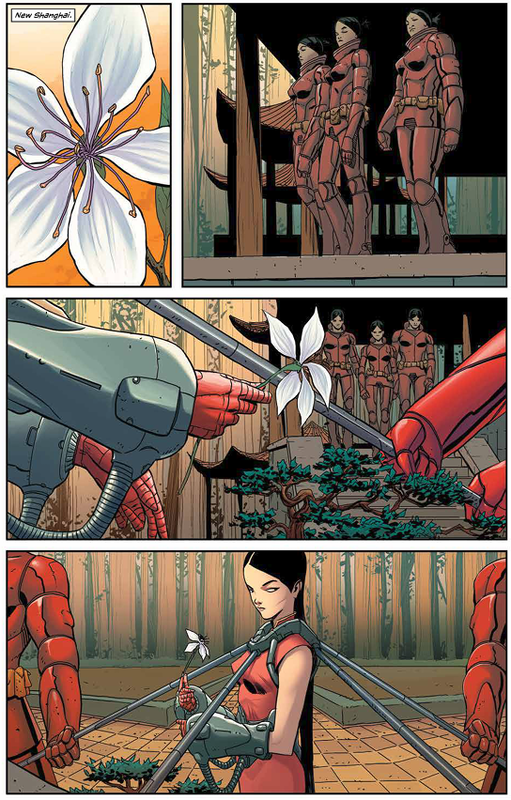 I would say, as well, that East of West has a better sense of long-game plot building. The characters are already interesting. Whether they’ll continue to be explored fully remains to be seen, but I’m hopeful. I received a copy of East of West for free in exchange for an honest review via Netgalley. This entry was posted in Graphic Novels and tagged Death, East of West, Graphic Novel Reviews, Graphic Novels, Image Comics, Mao. 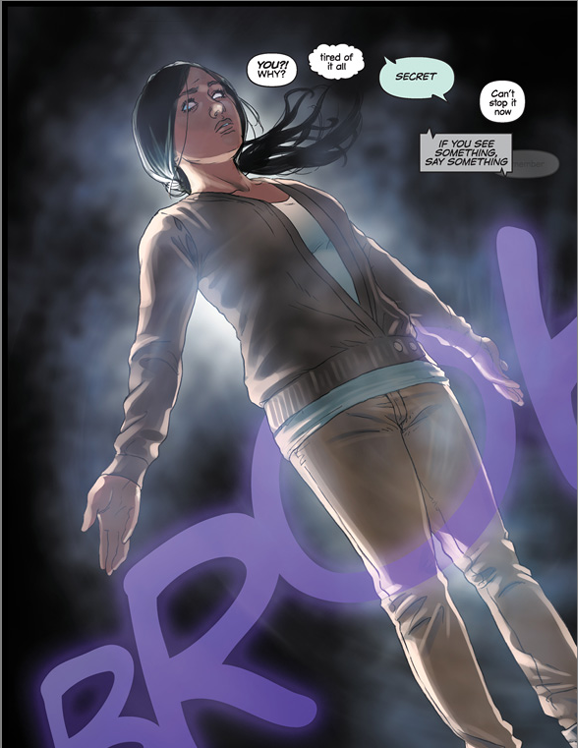 Mind the Gap, volume 1, follows Elle after she is attacked and in a coma. Her attacker is still on the loose, and coming to kill her. She has to find a way to communicate with the living before her attacker succeeds. I received a copy of Mind the Gap for free in exchange for an honest review. This entry was posted in Graphic Novels and tagged Ellis, Graphic Novel Reviews, Graphic Novels, Image Comics, Mind the Gap.